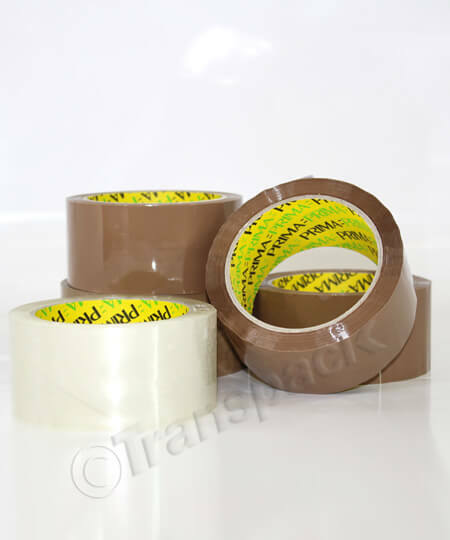 Our range of wholesale Packaging Tape includes different qualities of Brown and Clear packaging tape plus Coloured Packing Tape and Fragile Packing Tape. All taping products available for bulk buy in various volumes with discounts available. Years ago most packages were stuck down with paper based, water activated gummed tapes. These have now all but disappeared in favour of the modern PVC or PP tapes which are so much easier and quicker to apply. These packaging tapes are often referred to as "self-adhesive", but they are not. In fact all modern packing tapes are activated by pressure. Without pressing the tape down it will hardly stick; and, the better you press it down – the better it sticks! This is why it is important to use a proper dispenser which applies the tape with a roller to press it down. Another feature of such tapes is "curing time"; after applying the tape to your package there is a delay before the tape reaches it’s maximum adhesion. In warm weather this maybe an hour or two, longer if it’s cold. It’s better to keep packages out of direct sunlight during this time. Which packaging tape should I use? 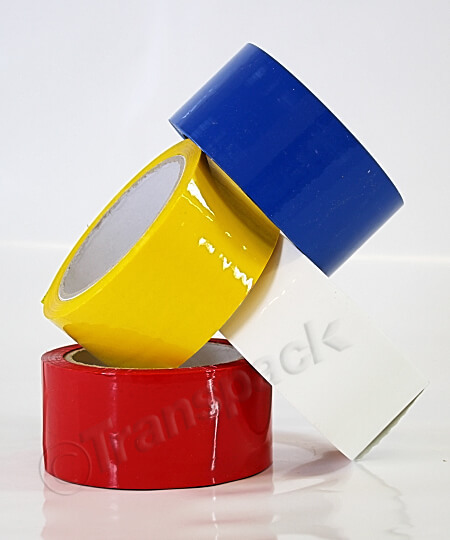 For normal packaging applications there are three types of adhesive tape. These are polyvinylchloride (PVC), polypropylene (PP) and silent (coated) polypropylene. Due to its environmental impact PVC tape is getting less widely chosen. PP tapes, on the other hand are much more environmentally friendly, cheaper and equally effective. No tape works well when its really cold and it pays to keep the rolls in a warmer place. However, if your boxes are going to end up in a freezer it makes good sense to use PP tape and not PVC. PVC tapes have a natural unwind resistance which, when used in a dispenser, pulls the dispenser roller down onto the package. PP tapes do not have such resistance and so need a "braked" tape dispenser so the resistance can be added. Normal PP tapes can be quite noisy as they unwind (its a good sign) and when the tape is being used constantly this can be a nuisance. To overcome this problem we also have a special PP tape which is coated to reduce the noise. (Silent PP - also referred to as GP Packing tape). How do I apply packaging tape to heavy boxes for export? For most standard cartons it is sufficient to bring down the flaps of the box and then run a length of tape along the length of these so the join is under the middle of the tape; the tape should run 50 to 75mm over the edge onto both ends of the box. It is import that the tape is pressed firmly down onto the box to ensure good adhesion. Some users start with a "holding strap" of tape across the flaps to hold them in position while the main length of tape is applied. For heavy and export boxes it is advisable to add a further strip of tape across the ends of the flaps – this hold the ends of the flaps onto the ends of the box. This is referred to as "H" sealing and provides a very secure package. Finally - smooth it down! Always, after applying tape to a package it is worth taking just a moment to smooth the tape down to ensure a good all over adhesion. What if my export country refuses plastic tapes? In this case you can use gummed paper tape through a benchtop dispenser. Non reinforced gummed tapes can be dispensed by an inexpensive "pull & tear" dispenser. For reinforced gummed tape (more usual for exports) you will need a slightly more sophisticated dispensing machine which is capable of cutting the tape. Because everyone wants something slightly different we don’t keep gummed tapes in stock - but we regularly supply it. Can I get my packaging tape printed? Yes - it’s a simply process that costs less than you’d think.